More than a dozen Democratic lawmakers spoke in the Rotunda at noon to lambaste Gov. Susana Martinez's recent executive order authorizing state police officers to inquire about the immigration status of a person suspected of a criminal charge. "I'm not disappointed, I'm outraged," said Rep. Eleanor Chavez of Albuquerque. 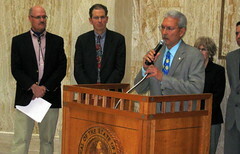 Santa Fe Sen. Peter Wirth said, " We are talking about jobs. We are talking about tourism. Look at Arizona," he said, referring to economic boycotts of our neighbor to the west over their controversial immigration law implemented last year. Sen. Richard Martinez, D-Espanola, has introduced SB152 which would prohibit law enforcement from detecting or detaining persons solely based on immigration violations. It's on the agenda of the Senate Public Affairs Committee this afternoon, though that's no guarantee it will be heard today.